Anyway, a few new things rolling off the work bench this week. What sort of wizards do you think they should be for Frostgrave? Jade Wizards - casting earthy-planty-hippy-magiks? Witches, then, perhaps? Which just gave me an idea! I should look through the L5R/Ronin stuff I have and find a pair of Shugenja and some warriors to come up with an eastern-themed warband for Frostgrave! I finally finished reading En Garde! and it looks like a LOT of fun! I’m hoping to get in a game this evening – or on the weekend at the latest. Looks like it will be a hoot! Hopefully a game report of En Garde! Odd and Sundry Items: Wizard, Swashbuckler, etc. 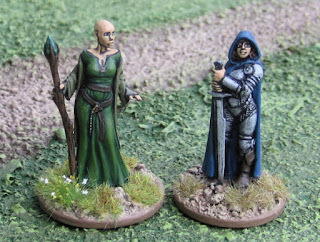 Two fantasy figures from Reaper Miniatures. the Wizard is for myself (and I need to find an apprentice for him!) 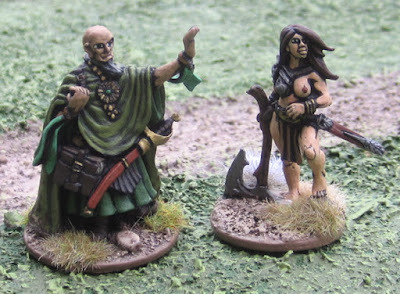 and the Barbarian woman is another addition to John’s Cheesecake Warband for Frostgrave. 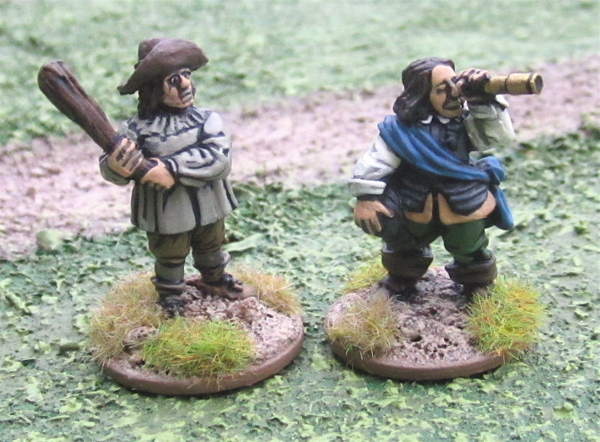 Two English Civil War figures from Wargames Foundry; a clubman and a general. 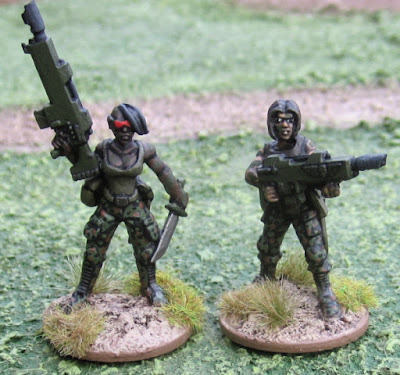 A woman with a Kalishikov assault rifle of some sort – also form Wargames Foundry. 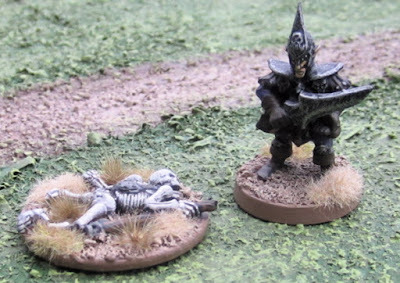 An old, old Dark Elf and a Skeleton casualty marker made from a Games Workshop figure. Finally another member of the Green Gang for En Garde! 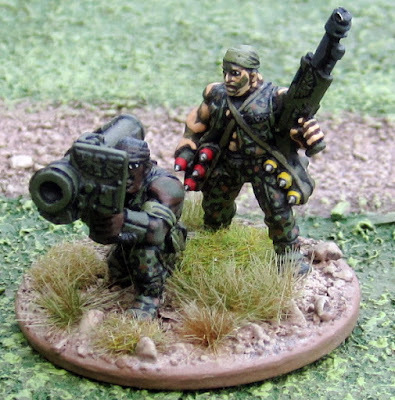 – also form Wargames Foundry. In other news, En Garde! arrived on Friday and it’s pretty much exactly what I expected (which is good!). I am very pleased to see how flexible it is and designed to be used in many theatres throughout the renaissance. I hope I can find some time to try it out sometime this week! More Swashbuckling Renaissance types… More Fantasy Warriors and Wizards… and hopefully an En Garde! game report! All these figures are from Wargames Foundry. I got to thinking it might be fun to organize a campaign in the kingdom of Florin during the reign of Prince (and later King!) Humperdink… I would have to convert a figure to add a sixth figure for Count Rugen. 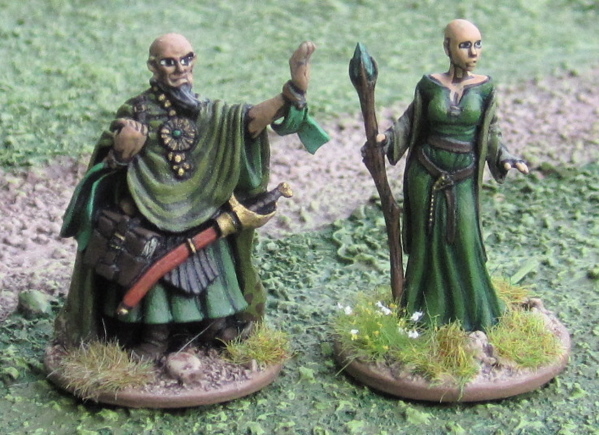 I found a few more figures I could paint up to finish up a couple of units for Dragon Rampant. All are Elves from West Wind Productions that I’d originally picked up to make elements for Hordes of the Things (actually, now that I think of it, they were picked up for a short-lived 28mm Warmaster project that quickly turned into a 28mm Hordes of the Things project…). They came in unit boxes of 24 so for each I planned to use 18 for HoTT elements and the remaining six would be individually based for skirmishing/role-playing. 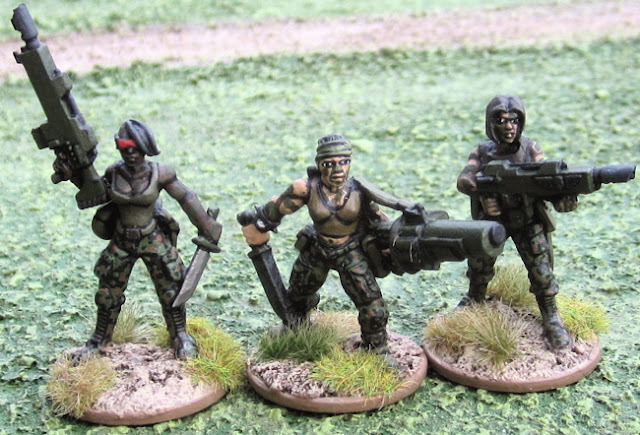 A few of them were painted eight years ago - One of the batch of three HotT Elements and the leaders of these two units. I couldn’t find when I painted the other three axemen, but I imagine it was about the same time. 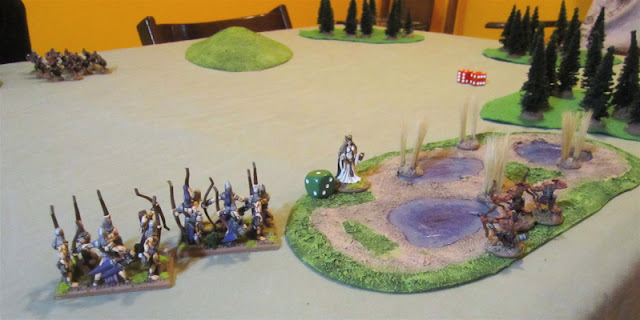 Elves with Great Swords – all but the champion are newly painted. I figured these could be fielded as Elite Foot for 6 points. Elves with Great Axes – two of the guys without helmets are not. These could also be fielded as Elite Foot for 6 points. I also have these Wood Elf War Dancers (I think I actually have a total of 18 now). What could I field them as? Bellicose Foot? Three reduced model units (6 figures each) of Bellicose Foot? The whole unit. 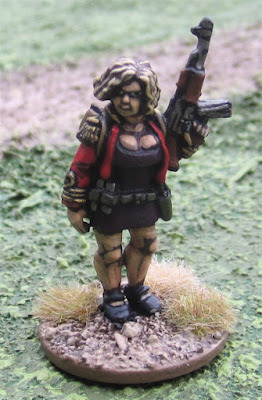 I painted most of these years ago (like, back when I was playing Mordhiem - which was a LOOOOONG time ago - before this blog was around!) – though I did do some touching up on a few as I painted the new guy. 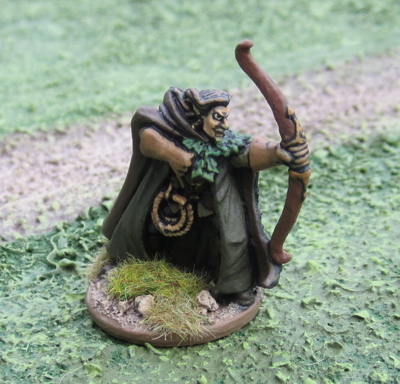 I see elite elf archer/scouts as the fantastical equivalent of modern Special Ops forces. There is a temptation to call these guys “Scouts” but scouts are actually crap at hitting stuff. I guess it would depend on the role I was expecting them to take in a particular action. If the goal was to be sneaky beaky and just get from one place to another and avoid contact… then yeah, maybe I would take them as scouts…. But if they’re more Direct Action Special Ops they would be better off as a Light Missile reduced figure unit (2 strength points per figure) with Sharpshooters for a total of 6 points. That would make them a small group of hard-hitting shooters that can take some hits. I was tempted, at first, to give them “Invisible” but for another three whole points (making the unit NINE points total!?) it seems a little weak considering all it does is make them immune to mundane shooting – they can still be targeted by magic and still be charged by anyone close enough and wishing to attack them. More Swashbucklers for En Garde! 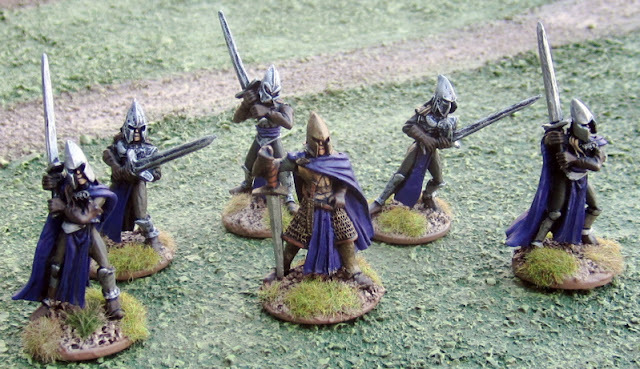 or some Elf Elite Foot for Dragon Rampant… or maybe something completely diffeent!? While working on more swashbucklers I also finished up a few medieval peasants to finish up a unit for Lion Rampant (or Dragon Rampant… or A Song of Blades and Heroes… or any medieval or fantasy role-playing or skirmish game… but it was Lion Rampant I had in mind when I purchased these and Lion Rampant I had in mind when I decided to finish up the unit… so… Lion Rampant). The new guys. These are all from Crusader Miniatures. The whole unit – at the moment. All but one is from Crusader Miniatures - I’m not sure where the one fellow with the sickle in the middle came from…. They seem a little too… I don’t know… “well-armed”..? to me. 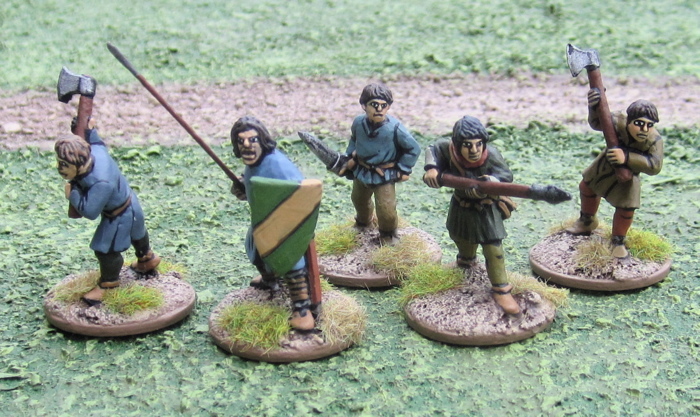 Luckily I included some Peasants from Black Tree Design in my latest order. They’re armed with scythes and staves and pitchforks and such that peasants really ought to be armed with. I will mix and match with these when they arrive to make two more believable units. 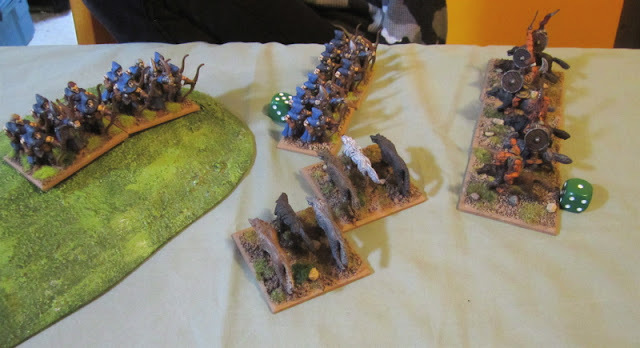 I cobbled together a couple forces that were a mix of multi-figure-based elements from Hordes of the Things armies and individually based figures for skirmish gaming or role-playing. I apologize in advance for the abysmal quality of the photos. The room we played in has the WORST lighting… I really need to clear off the tables in the basement and get back to playing games down there, were, unbelievably the lighting is better!? The nasty smelly Orcs of Puljack’s Punks have been rampaging about the good lands of Twinklebottom. Deciding this must be stopped Galadria Thistlebottom set out to intercept them and put an end to their rampage! We played the Death Chase scenario out of the Dragon Rampant book. 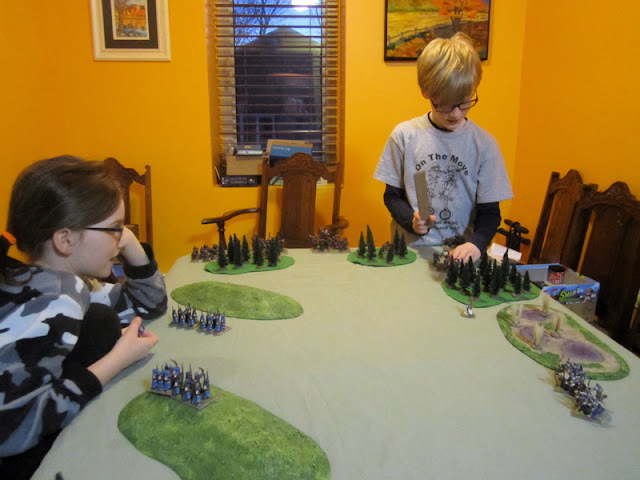 The boy played the “defending” Ocs (defending against an ambush set by the elves), and the Girl played the “attacking” elves. The Defenders set up on one short end of the table, the Attackers set up on either (or both) of the long ends but not within 18” of any of the Defenders troops. The Defender gets Glory points for getting troops off the opposite end of the table (3 points for a unit over half strength, 1 for a unit at or under half strength), the Attacker gets points (2) for each enemy unit destroyed or routed. I came up with the forces from my own collection of figures, but the kids provided all the names. 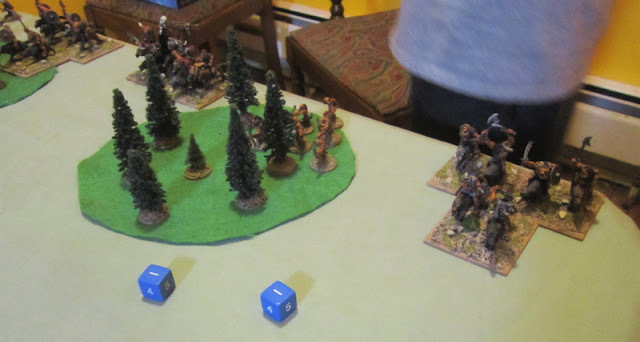 As per the scenario, The Boy set up his orcs in contact with one of the short ends and The Girl set up her elves on the long ends. At some point the kids selected some Glory Quests. The Boy picked “I Shall Strike the First Blow”, and the Girl picked “My Arrows Are Deadlier Than My Spears!” and “Our Missiles shall rain down upon them!”. We also rolled for Leader Traits. The Girl rolled “Brave” – her leader’s unit is not affected by Fear (which wasn’t really an issue as none of The Boy’s units caused fear). The Boy rolled “Sky Darkener” – each turn one unit within 12” automatically passes a shoot activation test… now THAT one the girl totally could have used. If she’d gotten that one this would have been a much, much shorter game! The Elves had the first go. The Girl decided to move Galadria Thistlebottom.. They seemed a bit reluctant to get things moving as well!? Galadria Thistlebottom cast Power Bolt on Puljacks Punks and knocked out one of the wolf-riding orcs. It was decided amongst the kids that what she actually cast was a torrent of toads and one of the wolves stepped on one and squished it into go and slipped on the goo and the Orc rider fell off and got one of the toads in his mouth and choked on it and died. Kids. Galadria Thistlebottom moved out into the middle of the battlefield to be in a more central location to both block the advance of the orc horde and offer support to the units under her command. 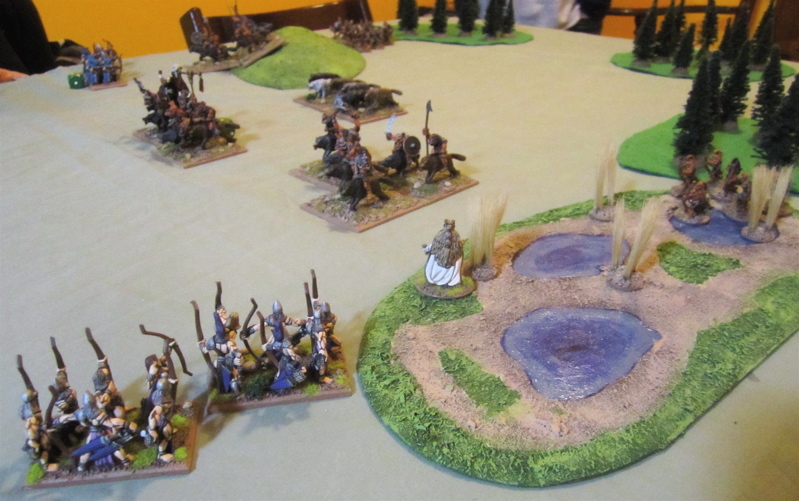 Then her units didn’t move and all of the orc horde moved rapidly towards her! Luckily the Orcs failed their first activation and went nowhere as well. 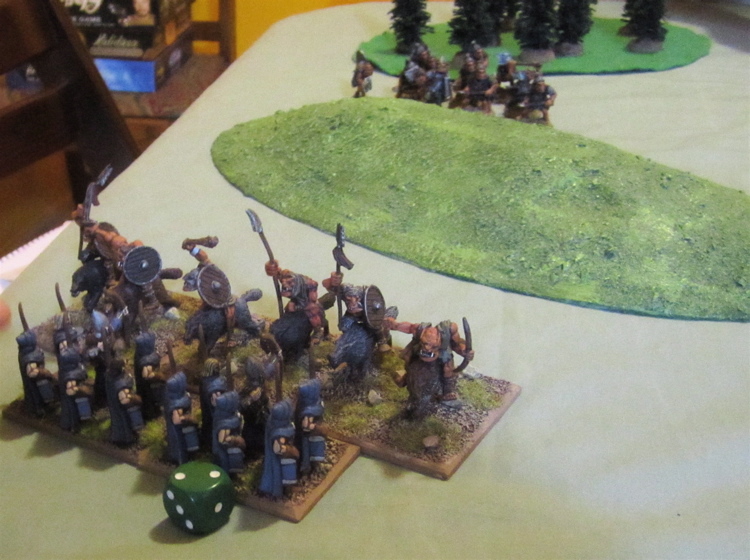 Then all the other Orcs units moved. Things not looking so good for the elves…. Yes, it was starting to look like these Orcs were just going to waltz across the table sweeping everything before them and the elves wouldn’t even get in a shot. 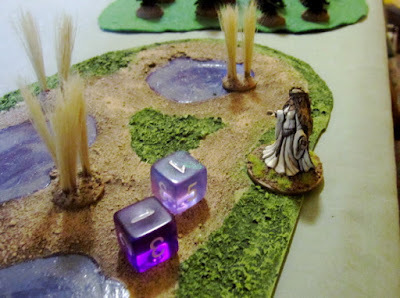 Galadria Thistlebottom started things off by unleashing another Torrent of Toads (Power Bolt) at the Skulhelm Brothers – taking TWO of them out of action! Then the Purple Loincloth Division 54 darkened the skies with their arrows and killed a third. Two Orcs getting killed when inundated with a Torrent of Toads… who could take that seriously!? It’s comical, right? 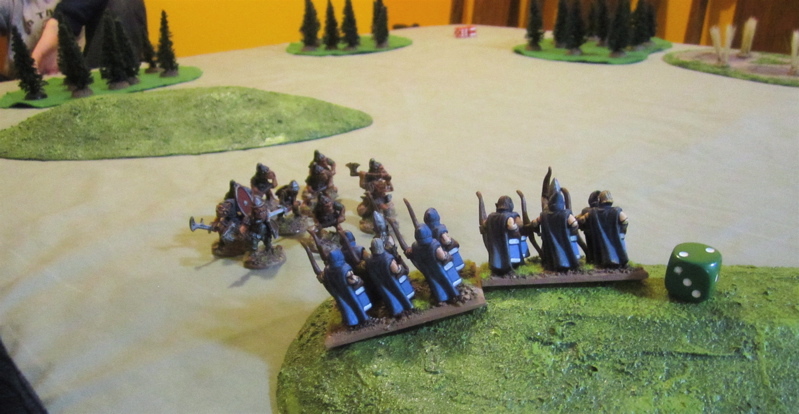 But when they lost that one dude to bow fire, well that’s when the Orcs lost it and fled! Unfortunately the archers on the other flank with the Orc Wolf Riders breathing down their neck didn’t quite get their stuff together enough to get off a volley before the wolves were upon them again (Elves failed to activate on a shoot order, Orcs passed another attack order… of course that was after the Skulhelm Brothers and the wolves failed their Wild Charge Check…). This time the Elves lost three more – but still managed to pass their courage check! Unfortunately they lost more than the single casualty their caused so they were obliged to retire once again. 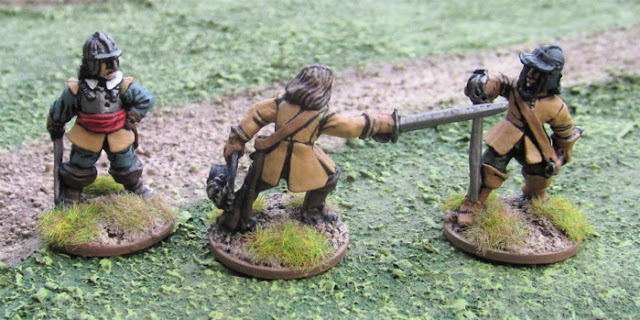 Puljacks Punks surged forward once again – almost leaving his entire warband behind!? Another move or two and they’d be off the table. So the Wolves did another Wild Test charge and tore off after the retreating elves! Three more elves were lost and this time they did fail their courage test (but luckily didn’t route!). 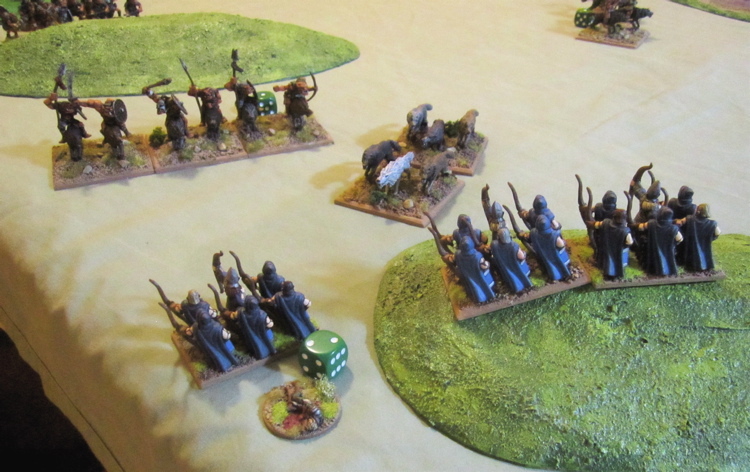 Brambley’s Boys failed the first Ordered Activation and were unable to follow up and chase down the fleeing Elves. The Girl failed to rally her battered elves and the remaining survivors fled off the table. The Bluehood Division 3 was made of sterner stuff and rained arrows down on the wolves that had mauled their comrades… killing one of them. But somehow that one dying wolf’s howls caused panic among the pack and set them to flight! Galadria Thistlebottom and the Purple Loincloth Division 54 rained down toads and arrows on the Skulhelm Brothers knocking two more out of action – leaving a single the Skulhelm Brother on the field – he kept his cool though passing all courage tests! Later in the turn the Wolves rallied and Brambley’s Boys charged up the hill at Bluehood Division 3 – both lost one in the melee, both passed their courage tests, so it was Brambley’s Boys that had to retreat back down the hill! The Skulhelm Brother, Puljacks Punks, and Gurjunk’s Grunts all moved. Skimpy’s Scouts thought they might shoot at the magician, but then a toad croaked nearby and it scared the living daylights out of them and they hid a little deeper in the marsh. Bluehood Division 3 rained arrows down on Brambley’s Boys, killing another but failing to scatter them. Puljacks Punks ran off the table edge scoring another +3 Glory. All the other orcs felt abandoned and were unable to activate this turn. Bluehood Division 3 rained arrows down on Brambley’s Boys once again, killing another two and cased them to fail a courage check and retire. Galadria Thistlebottom and the Purple Loincloth Division 54 just stood and watched on with awe. 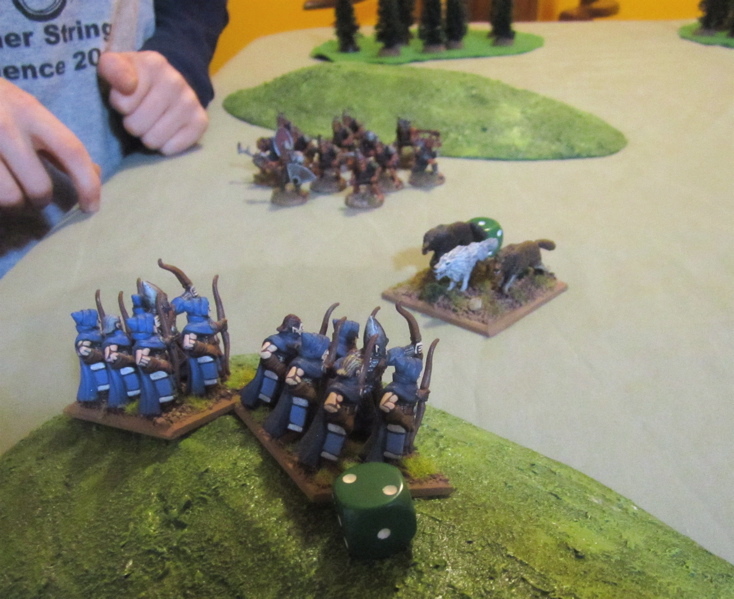 The Wolves activated on a Wild Charge and went up the hill after Bluehood Division 3. The Bluehood Division 3 would just not give ground! 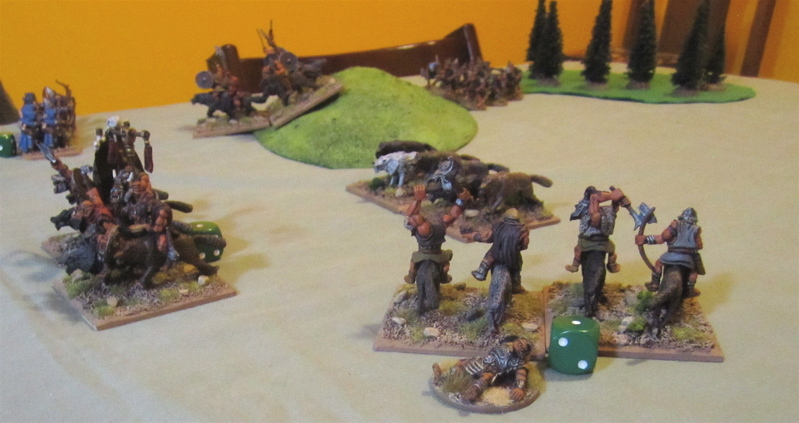 Though they lost one of their archers, they killed two more wolves and the wolves fled back down the hill. The Skulhelm Brother moved. Gurjunk’s Grunts moved. 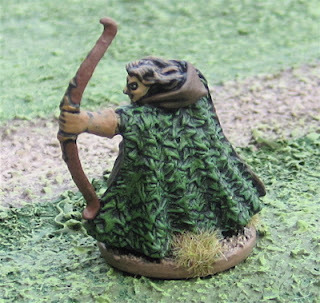 Skimpy’s Scouts shot at Galadria Thistlebottom and caused 1 Strength Point in damage – not a big deal, she’s pretty badass. Bluehood Division 3 shot down two of Gurjunk’s Grunts but the Orcs soldiered on. Well, not well enough to actually activate this turn… but well enough not to rout… just yet. While the girl clearly won, we weren’t sure about how to count her Glory Quests. One required that she rout or destroy more strength Points with Shooting than Attacks. Shooting refers to casualties caused by shooting, obviously, and Attacks refers to casualties caused by a unit making an attack on them, but what about casualties caused by magic or caused by a unit that causes casualties in while defending against an attack…? We couldn’t remember how each of them was destroyed immediately after the game. 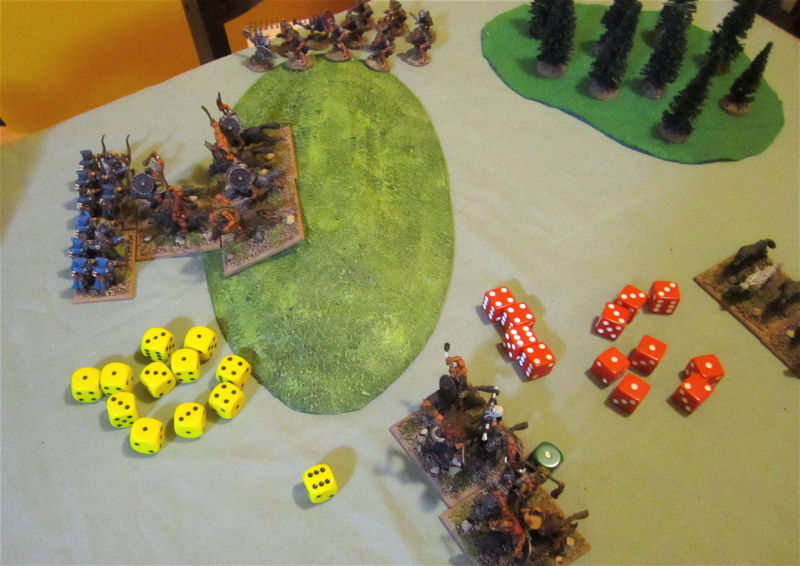 Looking back at my notes… I guess some were killed/routed due to shooting and none were killed by Attacks – because the elves made no Attack Activations the whole game. Gurjunk’s Grunts routed from damage caused by shooting. The last Skullhelm Brother was killed by shooting. But half of the earlier casualties were caused by Spellcasting. I’m nickel and diming here… I should just stop. Fun was had. Elves won. 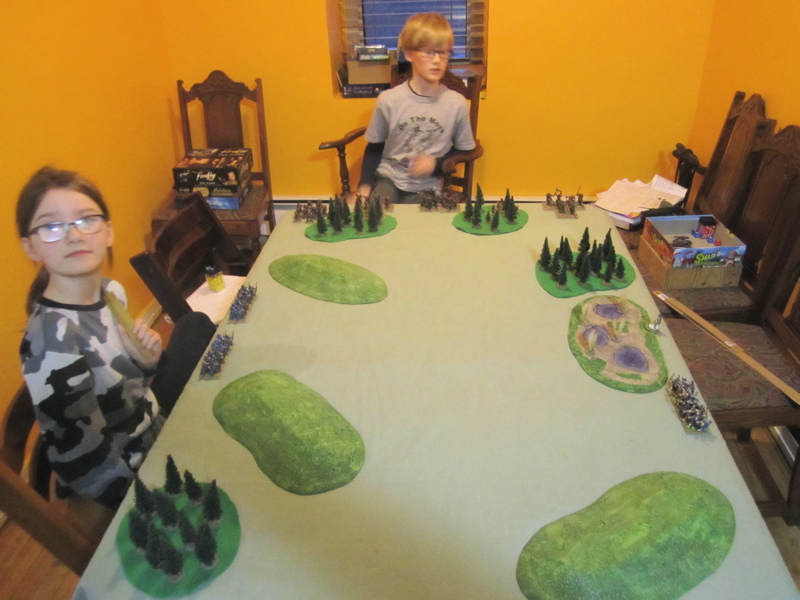 Despite his loss The Boy pointed out that his leader did survive and is determined to cobble together a warband of his own miniatures and fight again… Good game. Here are some more swashbucklers I hope will be useful for En Garde!. 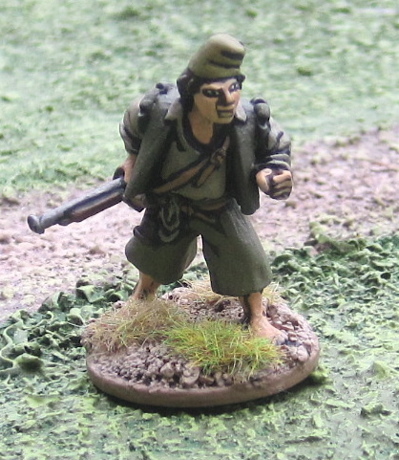 I really know nothing about the game, but I’m working under the assumption that it will involve gangs or some sort of team similar to theBuntai in Ronin – Skirmish Wargames in the Age of the Samurai with an average or 6-8 guys per side - maybe a bit more, maybe a bit less, depending on quality and such… I’ve started to organize these new figures into 4 teams or gangs in similarly coloured clothes. The Blue Boys – feeling a bit lonely by comparison – but I have more almost done! 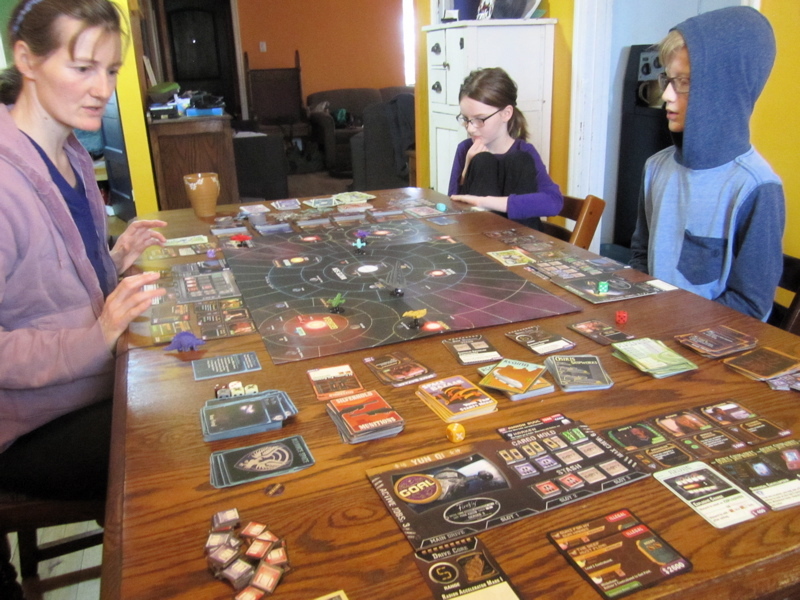 I got to play a game of Firefly with the family on Saunday afternoon. We played the easy (and shorter) “First Time in the Captain’s Chair” goals – as we haven’t played for a while and this was more or less just to refamiliarize ourselves with the rules. The Girl totally trashed us all – AND she did it all doing legal/moral jobs!? The game seemed so short we kept on playing to see how many more turns it would take the rest of us to complete the three goals. 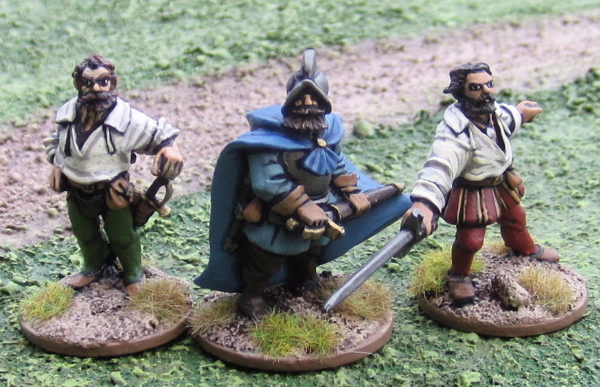 More Swashbucklers and some medieval peasants. Well now that I’m all done with reminiscing over the past year and planning this coming year, it’s time to get back to painting toys and playing games! With realease of En Garde! 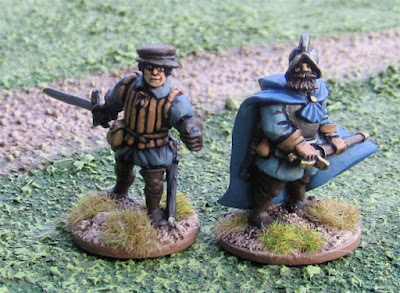 just around the corner I ordered some swashbucklers from Wargames Foundry during their 20% off xmas sale. They finally arrived this past week and here are the first few to roll off the workbench! At the same time I ordered a few more English Civil War miniatures – figuring they could also be used for swashbuckling adventures! Here is a gen-u-ine Games Workshop Imperial Guard rocket launcher team. This is one I got off ebay and the prevous owner decided to remove the bipod on this launcher unit…? 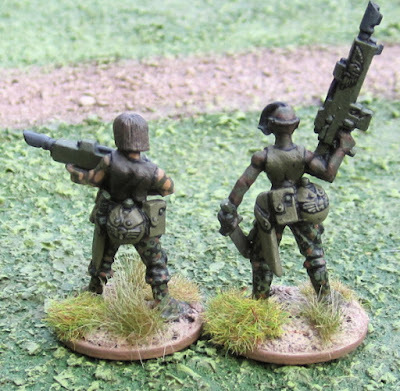 I was feeling there was a lack of female troopers in my Imperial guard units – and as Games Workshop makes startlingly few of their own, I ordered these women from Copplestone Castings and replaced their firearms with GW Lasguns.